I am looking for a an Italian cheese that I can use as substitute to Brie. It should have the same consistency and creaminess, as well as delicate flavour. The most similar, of course, the one you could easily find in any supermarket, is the "Camoscio d'Oro". This is not similar but the same, since is made by Bongrain SA, a French food group. As semi-industrial cheese made in Italy, we have the "Alpino", better or similar to "paglietta", both of Osella, which is sited in Piemonte (Turin), region on the border with France. You can find tomini freshly made​​, very sweet and tender, and, day by day, more and more seasoned tomini. The last ones can be done on the grill. If you switch to production typical, you can find a variety of high-quality productions of tomini and similar products in many farms in the region. Like "Montebore" or "Bra", or very similar products that, if you are lucky, you can find among the reserved ones from some kind local farmer. We share a border, mountains, traditions, people. We even have a whole region half Italian and half French, the Val d'Aosta. Incidentally also some cheese! FoodSubs claims Paglietta is similar. I don't read Italian, so I don't know what the Italian language wiki says about it. 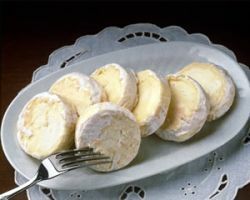 Brie is a soft cheese that is characterized by its creamy texture and velvety rind. It is only aged for two weeks to five at around sixty degrees Fahrenheit. Its unique texture and flavor is a result of the mold that is allowed to grow on its surface. 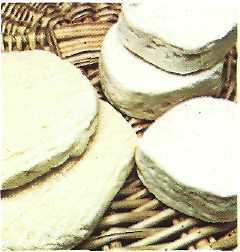 The mold partially digests the young cheese and creates the creamy texture. When the cheese is wrapped the mold is smashed and becomes the rind. Not the answer you're looking for? Browse other questions tagged substitutions cheese italian-cuisine brie or ask your own question. What is the difference between a brie and a brie de meaux?